I know I know....I lost $20 bucks on this one. 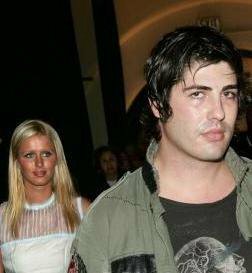 I picked Nicky Hilton with Paris Latsis and Brandon Davis with Kim Stewart but maybe I'll do better in the next go round. I believe that's set to go next week sometime. Anyways..... Brandon and Nicky made out at a fashion show. Blah. someone should really introduce him to "oil control makeup" or "shinefree crap" he looks disgusting..he probable doesnt shower either..peeuuuu! Could someone tell me what this guy does for a living. Is he in school? Is he learning his grandfather's business from the ground up? What does he do? Someone needs to lay off the drugs. I thought she was dating that guy from that show Entourage? These people go thru each other too quickly for me to keep up. He's sweaty from too much blow. YUCK! He is always sweaty and gross! Even without the sweat he is gross!